I come from a family of Dodger fans, so going to a Dodger game is a time-honored tradition. I bring this up because after the Dodgers beat the Cincinnati Reds, they had a screening of Back to the Future at the stadium. This is my review of Back to the Future! Back to the Future tells the story of Marty McFly, an aspiring musician who is accidently sent back 30 years into the past. When he becomes his mother’s romantic interest, he must get his future parents together to prevent altering his future. Now according to my mother, this movie was a surprise hit. Various studios rejected Robert Zemeckis and Bob Gale’s script until Zemeckis’ film Romancing the Stone was a financial success. This compelled Universal Studios to pick up the Back to the Future script and this turned out to be a great decision for Universal. Well, I was born six years after the movie came out. Last night was the first time I had ever seen it, so how does a film from 1985 hold up to a millennial living in 2015? The answer: It holds up very, very well. 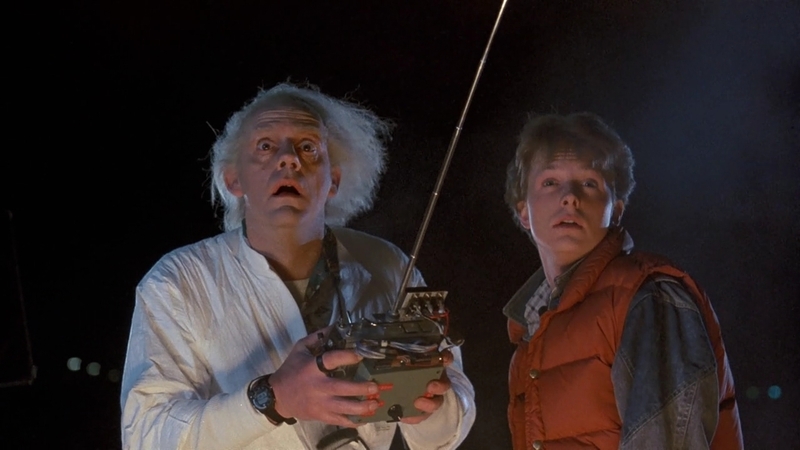 Back to the Future is a pretty freaking good movie! It is such a fun and entertaining story with loads of heart. Time travel is a story formula that has never been done completely right, but this movie handles it with great skill. Michael J. Fox was definitely a perfect choice to play the resourceful, dry-humored Marty. I like that he’s not an all-out bad boy stereotype. He’s a typical teenager with a bit of an attitude who truly cares for the people in his life. The real standout is Christopher Lloyd as Doc. Mad scientists characters are tough to portray without coming off as over-the-top, but Christopher Lloyd keeps his Doc intelligent and fast-thinking. There’s a rhyme and reason to his eccentricities. His moments of sincerity and genuine care for Marty is balanced with his quirks and bursts of ideas. This movie has a surprising amount of subtly. It will introduce things such as a clock tower or a neighborhood sign by having Marty pass by them without spelling out for us that those items will be important later. This respects the audience’s intelligence without being too cryptic. Finally the comedy is spot-on! Every joke is well timed, the witty banter never wears out its welcome, and the heartwarming relationship between Marty and Doc never feels contrived or emotionally-manipulative. The movie’s self-awareness keeps it from being campy, allowing it to be an entertaining adventure story. My only complaint is that I wish we learned how Marty met Doc. Is Doc a family friend or a former science teacher or something? The most that we learn is that Doc lets Marty use his garage so that he can practice his music. I know this isn’t an origin story of Marty and Doc, which is totally fine, but I would have liked some context regarding how these two characters came to know each other. Overall Back to the Future is my new favorite retro movie. To quote my mother, “It’s as funny today as it was 30 years ago!” I couldn’t agree more.